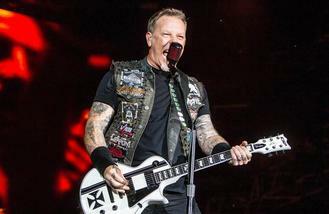 The 'Enter Sandman' hitmakers will have to start from scratch when they start working on their next album as frontman James Hetfield, 58, has revealed they won't touch music made in the studio on previous records. He told La Viola: "Once an album is finished the box of riffs is thrown away. We use the best. "There's no reason to save it if it's not good - we'll write new stuff. I'm very interested moving forward." Meanwhile, James recently revealed the band plan on touring for at least the next two years in support of their 10th studio album. He said: "We've booked out two years. So I can't predict the future, but we start there and hopefully there's more than that." And fans may not have to wait as long for a new LP from the heavy metallers as James said he is already dying to get into the studio again and doesn't want to wait as long to put out new songs. He said: "I would like to make some new music sooner thank eight years, for sure.